Orchids are an ever-popular indoor potted plant. While the exotic flower is widely available, many do not know how to care for an orchid to keep it blooming. 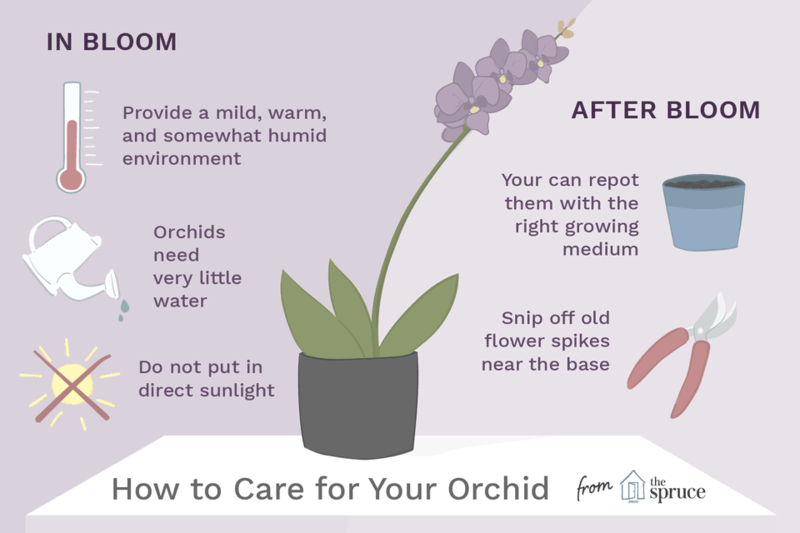 This article is designed to help you take those first steps to properly caring for your new orchid and transitioning it into your permanent indoor flower collection. Phalaenopsis, also called moth orchids. These plants have round flowers with a pronounced lip that grow on a single tall stalk arising from a whorl of fleshy, oval leaves. Flowers are usually white, purple or pink, or some combination thereof. Dendrobium, also called cane orchids. They have smaller flowers that grow in rows on stalks that arise from thick canes, often with several flower clusters per plant. Flowers are typically white or purple. Dendrobium leaves are narrow and emerge from the sides of the cane. Knowing the name of your orchid will help you later, after the bloom. When you first get your orchid, it will likely be in bloom. Obviously, you want to prolong the bloom as long as possible, so whatever the tag says, here are a few tips that can help. First, most gift orchids are potted in the wrong conditions for long-term growth. They are potted in plastic and packed with moss around the roots. In nature, orchids typically grow on trees, and their roots are water-gathering organs that need loads of fresh air flow to be healthy. Orchids with wet roots are susceptible to root rot and other problems. While the current container may not be ideal, you never want to repot a blooming orchid. It's too stressful on the plant, and it will drop its blooms. Instead of repotting, it's better to hold off on the water. Don't worry! Most people who are new to orchids think the plants needs loads of water to grow well, but it's just not true. Unless your orchids are growing in the open air, suspended in baskets where they can completely dry out within an hour of being watered, your orchid needs very little water. So here's a great piece of advice: Every time you think you want to water, wait three days. Or a week. Your plant won't suffer. Next, don't place your orchid where it will experience cold drafts or exposure to direct sunlight or heating vents. Very dry air, direct heat, and chills are the enemies of the exotic flowers. Your bloom will last longer if you can provide a mild, warm and somewhat humid environment. Provided your orchid is happy, expect the bloom to last at least a few weeks, sometimes more. When the bloom is over, it's time to shift your thinking from short-term care to long-term maintenance. After your orchid blooms, you will want to snip off the old flower spike near the base (some experts keep these spikes on, hoping it'll rebloom from the same spike, which does sometimes happen). Depending on the season, you may also choose to repot your orchid into a more friendly container with the right growing medium. When you're ready, learn how to encourage your phalaenopsis orchid to rebloom.